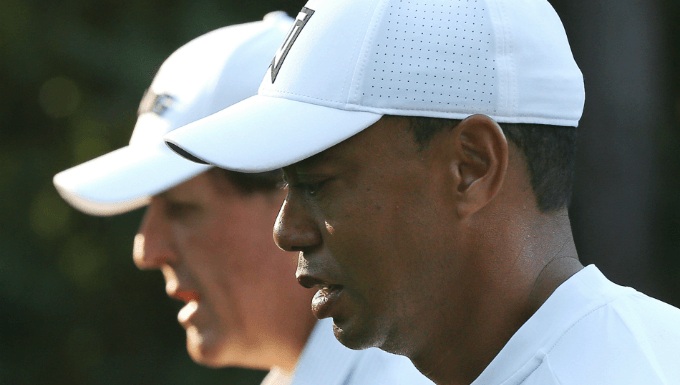 In one sense you could argue that The Match between Tiger Woods and Phil Mickelson is a wonderful echo of the past, a return to a form of Golf which fuelled its momentous rise in the late 19th century. In another, you suspect someone has been watching far too much Ocean’s Eleven. Both Old and Young Tom Morris were involved in many head-to-head duels which attracted more attention than the championships of the 1800s. As with much sport of that era, gambling was intrinsic to the action, with wealthy, and sometimes not so wealthy, members of the gallery throwing cash at the result (and many side-bets along the way). In that respect, The Match betting has pedigree. Yet the notion of Tiger Woods (1/2 favourite) and Phil Mickelson (7/4) suddenly becoming nostalgic for golfing days of yore is rather less persuasive than the idea that late one night Phil was idly flicking between Shell’s Wonderful World of Golf and George Clooney plotting a Vegas heist when an idea started to form in his head. The Match – What Is It? Bizarrely, we still don’t the exact format, but we do know that it will be Tiger Woods versus Phil Mickelson at Shadow Creek GC in Las Vegas on on Friday, November 22. The winner-takes-all prize money is a whopping $9 million, but there will be no fans allowed on the course, instead you can tune in for $19.99. To ramp up the Ocean’s Eleven vibe, ex-basketball star Charles Barkley and actor Samuel L Jackson will perform on-course commentary, whilst Woods-Mickelson chums Darren Clarke and Pat Perez, plus Natalie Gulbis, will provide expert analysis. The alpha-male-geiger-counter will most likely self-combust with all the banter and trash talk, and whilst that will prompt many to concentrate on pumpkin pie (or tighten their sphincters tighter than they’ve ever been tightened before), for many it will be the highlight of the day. For all his cheese, Phil can come out with some excellent lines and he’s revealed himself a decent enough actor in some of the promo material. Much of the audience will be with him and a highlight will be watching him veer between the good and the bad (much like his golf). Mickelson, as big as 7/4 to win with William Hill, insists that the idea came to him during this year’s Players’ Championship when he thought let’s cut “the ancillary stuff of a tournament and just go head-to-head”. If the ancillary stuff is 'getting in contention', Mickelson has certainly cut that. Since victory in the Mexico Championship in March he’s been within seven strokes of the 54-hole lead just once in 17 attempts (and that was five back). He is legendary for loving a big-money game during the practice rounds – and for being very good at them too. His chutzpah, sledging and love of a big moment are said to be vital to this success. In head-to-heads, however, does he prefer being a big fish in a little pond? In 14 appearances at the WGC World Match Play, he’s never once made the semi-final stage (and only twice the last eight). In the Ryder Cup he’s won two of nine singles matches in the 21st century and went 0-2 in the Ryder Cup this year.
.@PhilMickelson knows EXACTLY how to get under @TigerWoods' skin. One of the (many) peculiarities of this set-up is that you’ve got one player (Mickelson) who is historically poor in head-to-head golf up against another (Woods), who famously doesn’t very much like it. Admittedly the latter’s grievance is with the matchplay format (we are yet to have confirmation of Friday’s rules), but despite three WGC World Match Play titles Woods has never hidden his distrust of it. Woods, the 1/2 favourite to win with Paddy Power, also shares Mickelson’s haplessness in the Ryder Cup, although he does at least have a positive record in singles (although a total of 13 wins from 37 matches is remarkably poor). In fact a head-to-head match between the two least impressive performers in the Paris Ryder Cup (Woods went 0-4) is hardly the sub-text anyone had in mind when The Match was conceived. Don’t forget, one of the great episodes in the Tiger cannon. Back in 2006 Stephen Ames said of his upcoming tie against Woods in the first round of the World Match Play: “Anything can happen, especially where he’s hitting the ball.” The Woods response? A stony-faced 9-and-8 annihilation. The Match – The Winner? The bookmakers consider Woods a heavy favourite in The Match betting, and you’d need a lot of faith in Mickelson’s audacity to back him, even at 7/4. Tiger is a best price of 1/2 with Paddy Power, and has to be the best bet.